Do you try to participate in all the Cascade Bicycle Club rides and events in western Washington every year? If so, you’ll want to check out the Cascade 2014 event calendar. The nonprofit club, boasting more than 15,000 members, is the largest such bike club in the US. The 18 rides and events listed on the 2014 calendar are also open to nonmembers, although they usually have to pay a higher registration fee and don’t qualify for early bird registration at the beginning of the year. The calendar below doesn’t include more than 1,000 free daily club rides for members and nonmembers alike. Seattle Bike Swap — Feb. 9, 2014 100 vendors offer new and used bicycle related goods for sale. 9 a.m. til 2 p.m. at Seattle Center Exhibition Hall, 225 Mercer St. Chilly Hilly — Feb. 23, 2014 The year’s first big ride loops around Bainbridge Island for 33 miles. Seattle Bike Expo – March 1-2, 2014 Technically not a ride, but it’s a huge event and it’s all about cycling. Smith Cove Cruise Terminal 91, Seattle [consider Elliott Bay Trail (Terminal 91 bike path)]. Commute Challenge — May 1-31, 2014 Teams raise points by participating in Bike to Work Month. Bike to Work Breakfast — May 6, 2014 Celebrates Bike to Work Month with breakfast and networking at the Sheraton Hotel. F5 Bike to Work Day — May 2014 (to be announced) Dozens of bike commute stations are set up around Puget Sound to encourage those who bicycle to work. Seattle Bike n Brews Cruise — May 2014 (date to be announced) Launched in 2013, the urban Seattle bike ride visited a couple of brew pubs. Flying Wheels Summer Century — May 31, 2014 A ride through rural eastern hills and valleys or a prep ride for Seattle to Portland Classic. Starts at Marymoor Park in Redmond. World Bicycle Relief Red Bell 100 — June 28, 2014 This one-day ride from Redmond to Bellingham is a fund-raiser for World Bicycle Relief and Cascade Bicycle Club Education Foundation. Seattle to Portland Bicycle Classic (STP) — July 12-13, 2014 More than 10,000 cyclists ride the 200 miles to Portland in one or two days. Starts at University of Washington. This one sells out early. Cyclefest — July (Not being held in 2014) The biggest stage of the Tour de France is shown on an outdoor screen at Seward Park. Other activities as well. Coincides with Thursday bike races at the park. Ride Around Washington (RAW) Aug. 2 – 8, 2014 A week-long supported bicycle tour that visits a different part of the state every year. Limited to about 200. 2014 route to be announced. RSVP – Ride from Seattle to Vancouver (B.C.) and Party! Aug. 15-16, 2014 The two-day ride rolls out from University of Washington, spends the night in Bellingham, and concludes in Vancouver. 188 miles. RSVP 2 Aug. 16-17, 2014 A second ride that was added after the first became too crowded. High Pass Challenge (HPC) — September 2014 (to be announced) This one-day ride gains more than 7,500 feet of elevation over 114 miles in the Gifford Pinchot National Forest. BikePACParty– September 2014 (to be announced) A dinner for staff, volunteers and donors to support the political action committee. Kitsap Color Classic — Sept. 21, 2014 Begins with a ferry ride to Kingston for a tour of various towns on the Kitsap Peninsula. Annual Membership Meeting –– October 2014 Club meeting and vote. 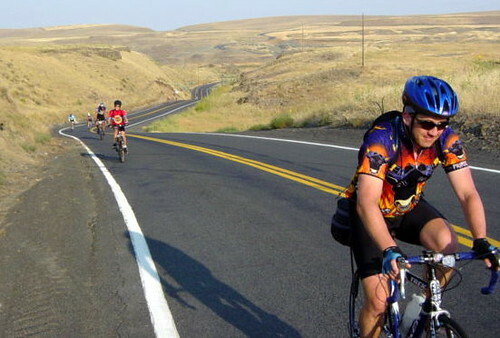 A few years ago, Cascade instituted a policy that allows individuals or groups to use Cascade bike rides as fund-raisers for favorite charities. Check out Riding for Charity? to see how this works. Stinky Spoke — Jan. 18, 2014 The Stinky Weather Poker Run is a 16-mile ride over a mountain bike course to collect playing cards. Best hand wins. Traditionally the wettest and coldest day of the year. Benefits the Little Bit Therapeutic Riding Center. Starts 9 a.m. at Red Hook Brewery, Woodinville. Mussels in the Kettle — March 1, 2014 A non-competitive mountain bike poker ride that starts in Coupeville and rolls out to Kettles Trails and Fort Ebey. Three routes of about 7, 9 and 11 miles — easy to expert. Presented by the Whidbey Island Bicycle Club. Renton Ramble — March 8, 2014 Choose from 3 routes of 20, 40 or 60 miles to start the cycling season. Proceeds go to charitable projects of Renton Lions. Check back for links to website. McClinchy Mile – March 2014 (date to be announced) Three bicycle loops — 34-mile flat and scenic or 48 miles to Granite Falls or 52 miles to Stanwood — through Snohomish County that begin in Arlington; sponsored by BIKES of Everett. Pedal Against Trafficking Humans (PATH) – March 30, 2014 Ride a standard loop of Mercer Island for 13 miles or tack on a visit to Seward Park for 28 miles. Raises funds to address the problems of human trafficking. Presented by Veloce Velo Bicycles and Seattle Against Slavery. When in July is CycleFest 2014 at Seward Park? Cascade tells me that they’re not organizing a Cyclefest in 2014. Sorry. Why no cyclefest this year? It’s been such a great tradition and I don’t think we’ve missed one yet. Especially enjoyed combining with the Seward Park races. Hope it’ll be back next year!